Fans were lining up for tickets five hours before the scheduled start. It was standing-room only for the third period of the junior varsity game. By the start of the featured attraction, a "sold out" sign had been taped on the ticket counter. The last few stragglers who made their way into the Vadnais Heights Sports Complex were parking at nearby car dealerships and trekking through the venue’s packed parking lot into the jammed lobby and then peering into the stuffed-to-the-rafters arena. “We knew it was going to be a big crowd when we did pre-skate and there were 400 people standing looking through the windows waiting to get in,” White Bear Lake coach Tim Sager said. Hill-Murray vs. White Bear Lake is always a hot ticket. This, though, was a special occasion in one of the state’s most storied rivalries. The Bears were playing in their new home rink, wearing their new jerseys, dressing in their plush new locker room. 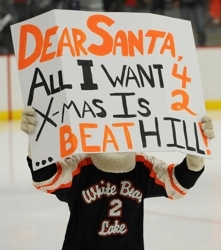 Hill-Murray ruined what was to be White Bear Lake’s big open house party by beating the Bears 3-0 in front of a crowd estimated at 1,500 on Thursday, Dec. 23. The win extended the Pioneers’ mastery of the rivalry to 14 straight victories. 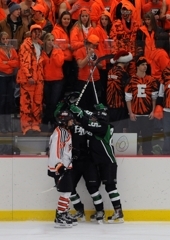 White Bear Lake’s huge student section – decked out in blaze orange – eagerly was anticipating a Bears victory. There were huge roars during an entertaining JV game, with the promise of even higher decibel levels and zaniness to come during the varsity showdown. Those ear-splitting cheers never materialized in a game that couldn’t come close to matching the hype – or the opening act for that matter. Hill-Murray’s stifling defense sucked the excitement out of the building as effectively as a Shop-Vac cleaning up sawdust. The Bears had six shots in the first period, four in the second and two in the third. Had the game gone any longer, Pioneers goaltender Tim Shaughnessy could have strayed from the goal, taken an early shower and watched the finish from the bench with no ill effect on the Pioneers. If not for Schletty, the outcome easily could have been much worse for the Bears. Schletty made 32 saves. 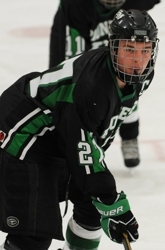 He kept White Bear Lake within a goal until Hill-Murray, ranked No. 10 in Class 2A, scored twice in a span of 15 seconds in the third period to pull away. After Hill-Murray’s rapid-fire goals from Kevin Becker and Jake Guentzel midway through the third period, some of those late-arriving Bears fans started heading for the exits and the long journey back to their cars. Neutral or not, Hill-Murray knew what to expect. Controneo said he noticed the sea of orange in the stands during warmups, but after the first few shifts, “it’s all between the boards,” he said about his focus. Hill-Murray started the season with two losses in its first three games, an unexpectedly poor start for one of the state’s most storied programs. 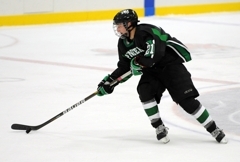 As the Pioneers were working the kinks out of a revamped defensive corps, they were matching up against Burnsville and Benilde-St. Margaret’s, top-10 (Class 2A) teams that feature high-powered first lines. Hill-Murray lost both of those games, but have since won four straight, including Thursday night’s 3-0 triumph over rival White Bear Lake. 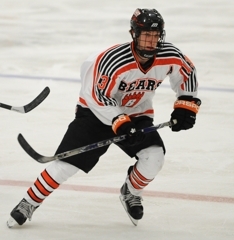 Lechner wouldn’t get into specifics about what the Pioneers did to shut down White Bear Lake’s explosive top line of Brandon Wahlin, Max Birkinbine and Mitch Morrisette. It was clear, however, that the game plan was to clog the neutral zone and, when Birkinbine and Wahlin did have the puck, to apply instant pressure – and, even better, a hard hit if at all possible. Goals by Kevin Becker and Jake Guenzel 15 seconds apart in the third period propelled Hill-Murray past White Bear Lake 3-0 in the annual renewal of one of the state’s most fierce – and lopsided – rivalries on Thursday, Dec. 23. 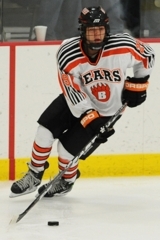 A packed Vadnais Heights Sports Complex crowd of about 1,500 – most of those fans wearing blaze orange in support of the host Bears – witnessed a defensive struggle that saw Hill-Murray (5-2-0), ranked No. 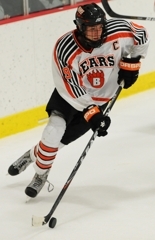 10 in Class 2A, limit White Bear Lake (5-2-0) to 12 shots – including just two in the final period. 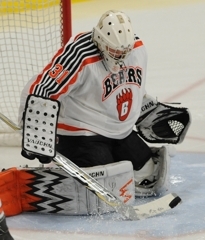 Bears goaltender Jared Schletty, a junior battling to earn a full-time starting position, singlehandedly kept the game close by making 32 saves. 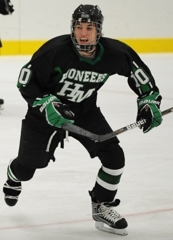 He was particularly busy during the second half of the second period and into the third, when the Pioneers continued to ratchet up the offensive pressure. Hill-Murray’s Ben Bahe opened the scoring 9:03 into the first period when he broke in alone on Schletty and fired a shot just inside the left goalpost. The score remained 1-0 until the Pioneers put the game all but out of reach with their rapid-fire goals midway through the final period. 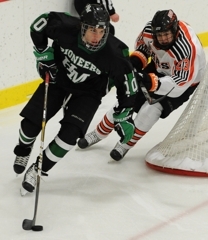 The victory extends Hill-Murray’s winning streak over White Bear Lake to 14 games. 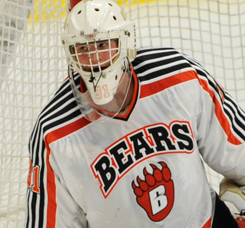 The last White Bear victory over Hill-Murray was on Nov. 23, 2004. The Bears won 3-2 at Aldrich Arena for what was their third straight triumph over the Pioneers. The matchup between the teams was the first at White Bear Lake’s new home. The Bears previously had shared Aldrich Arena with Hill-Murray as their home rink. 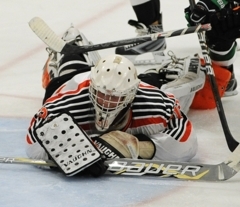 Yes, Pioneers goaltender Tim Shaughnessy got the shutout, but it was the Hill-Murray defensive corps that controlled this game. Controneo had an assist on Jake Guentzel’s third-period goal, but that was just a small part of Controneo's performance. 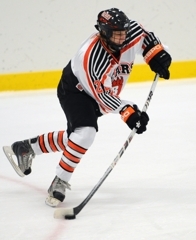 It was his neutral-zone clogging and heavy hitting (he had numerous big checks on top White Bear Lake forwards Brandon Wahlin and Max Birkinbine) that was most impressive. 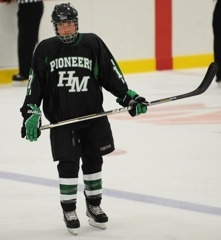 The junior goaltender admitted to feeling a bit shaky at the start, but he was rock-solid until midway through the third period when the Pioneers’ avalanche of shots simply became too much to withstand. He finished with 32 saves and provided precious few second-chance opportunities. The senior forward didn’t show up on the scoresheet, but he was probably the most consistent Pioneers forward in terms of creating quality scoring chances. During one second period shift, he controlled the puck for at least 30 seconds and created two good scoring chances in the process.